Founded by the Missionary Sisters of Our Lady of the Angels from Canada over ninety years ago, St. Clare’s Primary School has remained as a private Catholic primary school with a feeder secondary school – St. Clare’s Girls’ School. We cater to students from diversified cultural backgrounds and adopt a curriculum based on the one provided by the Hong Kong Education Bureau. We will be offering 3 classes of Primary One in the 2019 / 2020 school year. This is a whole-day school for girls. Information of the School is available on the School Website. Scholarships will be offered to students showing good conduct or attaining high academic achievements or excellent performances in areas such as music, dance, sports or other disciplines in art. All information provided on the Application Form and all items submitted along with the Form are for the admission procedures only. Upon completion of the admission procedures, all forms and items submitted will be destroyed and will NOT be returned. Selection will be based on the applicant’s performance during the interview(s), additional information attached to the Application Form of the applicant will be for reference ONLY. False information will result in disqualification of the applicant. 21st September, 2018 (Friday) 8:30 a.m. – 4:00 p.m.
4. Application documents should be arranged in the following order during submission. Please clip the documents at the top left hand corner. Do not put them into any file or clear folder. 6. 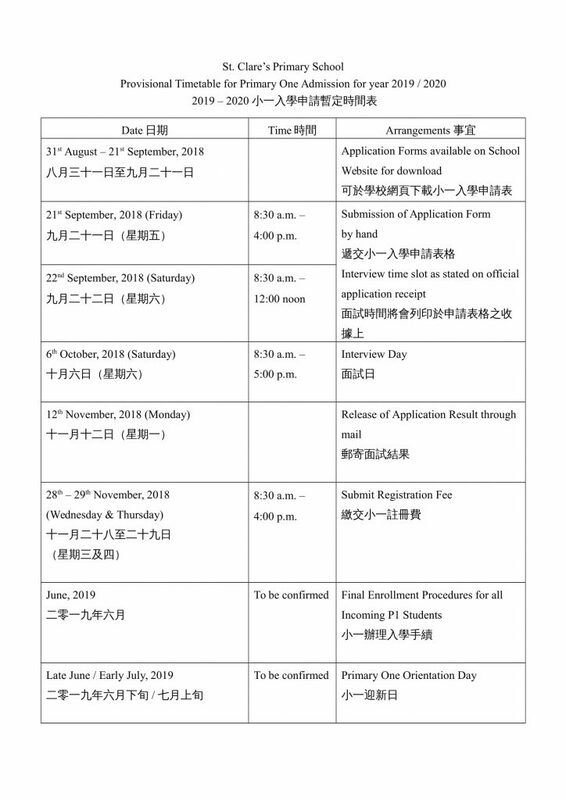 Interview in the children’s mother tongue will be scheduled for all applicants on 6th October, 2018 (Saturday). Observe interview time slot as stated on the official application receipt. 7. Application result will be released through mail on 12th November, 2018. 8. * Please read Provisional Timetable on separate sheet.